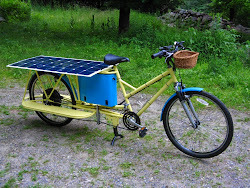 I am planing a similar bike build. 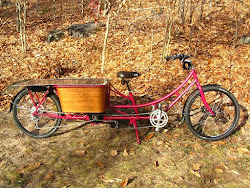 My target is bakfiets type bike, which could carry me and two kids. This would amount to 350 lbs of weight. What size of tubing have you used for your bike frame, have you tried it with bigger loads than yourself? Thanks. The main tube on the bakfiets is 2" (inch) diameter. The box is 31" long, and the longest tube span of 32" is under it (and it is 54" overall to the pedals). My weight and the heaviest loads I carry have been about 250 lbs, and it has not bent at all. The 31" box is very big and a shorter box would be even stronger, but there are too many variables for me to say it would definitely work at 350 lbs. I've been using 0.060" wall tubing and am trying to change to 0.040" to save weight, but you do have to be more careful with the welding. I'm also exploring using two small tubes as the top and bottom of a truss (i.e. the longtail). Mike Burrow's 8Freight bikes use a fairly small lower main tube over a long span, but he also has a top hoop that is helping to support the load. (He has had cracking problems in the tubing, I think because it is flexing a lot around the corners and is aluminum.) You can get a stronger frame if you make the cargo box part of the structure. I'll also mention that the Bullitt uses much taller frame tubing under the cargo area, but it is a long, open cargo span.